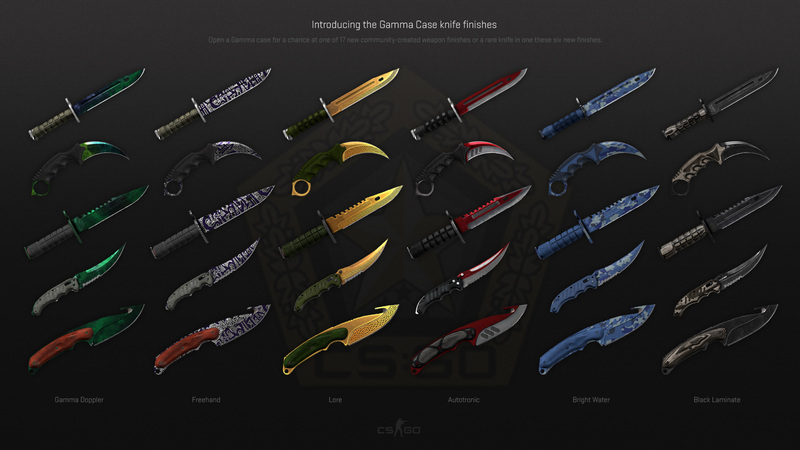 – Added new Gamma weapon case featuring 17 community-created weapon finishes and all-new knife finishes. – Operation Wildfire Access Pass is no longer available for purchase. – New CS:GO players will get a significant earned XP boost multiplier in Recruit and Private Ranks. – Competitive matchmaking for new CS:GO players is now unlocked sooner, as soon as they rank up from Recruit to Private Rank 2. – CS:GO accounts will be Prime if they have verified their phone number and achieved at least Lieutenant Rank 21 or have earned a Service Medal. – Prime accounts can now select to search only for other prime accounts in competitive matchmaking. – When matchmaking with a party lobby, all party members must be Prime to have the Prime-only option available. – New sound cue for shooting with low ammo. – Upgraded sound fidelity, reduced distortion for Mag7, M249, Negev. – New smoke sound to reduce interference with bomb defuse sound. – New sound for text chat messages in party lobby. – In classic game modes any money earned by a player mid-round will no longer be available for spending during the same round (i.e., SMG purchases are no longer possible during competitive pistol rounds). – Suicide or disconnect compensation will no longer be awarded in warmup or during freezetime period. – When controlling the bot and surviving round running out of time, the controlling player is now eligible to receive end of round money. – Removed a legacy 2.5 seconds spawn grace period for players who reconnect to the round after freezetime is over. – Increased upper limit on possible mp_halftime_duration values to 5 minutes. – Added server convar sv_spec_post_death_additional_time that allows adding a delay for spectators between the death of a spec target and the switch to a new target. – The convar sv_alltalk has been replaced with sv_talk_enemy_dead and sv_talk_enemy_alive. – Fixed appearance of fonts in the community browser and console. – Fixed some bugs with setting fullscreen resolution. – Set all Mac players to use Raw Mouse Input by default since this is a better experience for most players. Players can manually revert to not using raw mouse input if that is what they prefer. Gamma Doppler, Lore & Autotronic va snyggast, enligt mig. #1 Är beredd att hålla med. Har svårt att klaga på någon av de nya dock.